When it comes to Italian food in New York, pizza dominates the conversation. And while we ARE a pizza town at heart, the pasta here has also long been indisputably the best outside of Italy -- and decades of Italian New Yorkers crafting homemade red sauce classics, combined with chefs' never-ending need for innovation, leaves us with the most delicious and diverse pasta options we've ever seen. From a bucket list-worthy lasagna better than your mom's to a chicken liver pasta from one of the city's star chefs, these are the best pasta dishes in New York City. If you can score a res at the Carbone/Torrisi/Zalaznick crew’s Italian-American red sauce joint, ordering the rigatoni goes without question. With all due respect to Italian grandmothers everywhere, this might just be the best version of vodka sauce out there, featuring onion soubise -- a play on béchamel using onion puree that brings an added rich texture to the classic cream, tomatoes, pecorino, and Calabrian chilies. 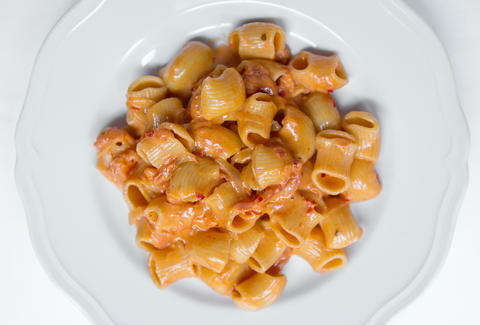 The rigid housemade maccheroni, cooked perfectly al dente, has just enough texture to take on all that sauce. You can believe the Instagram hype. 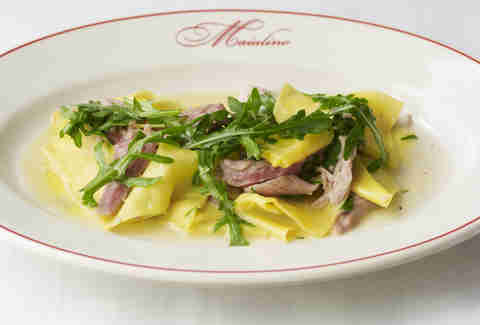 Jonathan Waxman’s famed Italian eatery has remained packed since its inception in 2004, partially because of its central West Village location and its cool, rustic modern decor, but mainly because of its signature roast chicken with perfectly crispy skin, and tender and juicy meat. But as memorable as the homestyle chicken may be, don’t let it distract you from the kitchen’s equally strong pasta game. 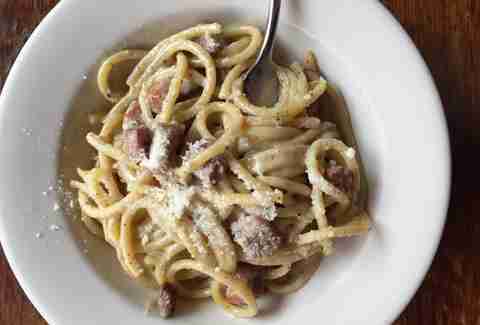 The carbonara became an instant classic when Barbuto opened its (garage) doors 12 years ago. Previously made with spaghetti, this iteration features hearty bucatini tubes, but maintains the same beloved sauce with dry-cured Beretta pancetta from Pat LaFrieda, fresh ground black pepper, farm fresh egg yolk, and parmesan. Midtown’s bi-level steakhouse serves modern twists on traditional Italian-American fare like a showstopper chicken parm that’s the size of a pizza. 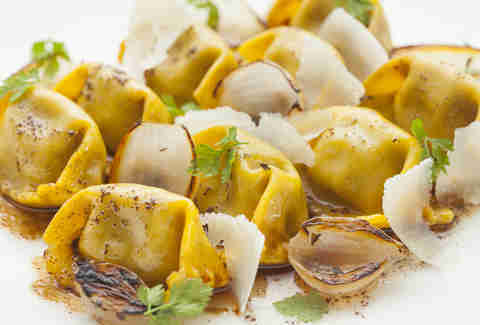 But the move here is really this signature dish, featuring shreds of month-long dry-aged porterhouse tucked inside agnolotti pockets in tangy vincotto-spiked brown butter. Bonus: getting both your steak and pasta fix in one course leaves more room for the cannoli cart. 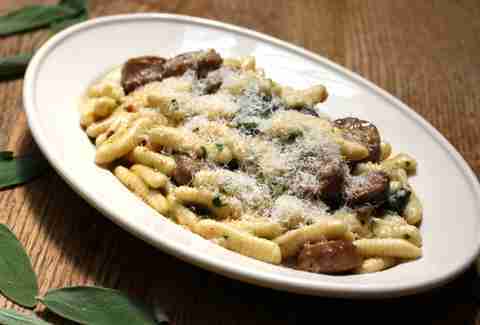 One of the city’s more authentic Italian experiences, Bar Pitti offers truly classic, homemade Tuscan food. 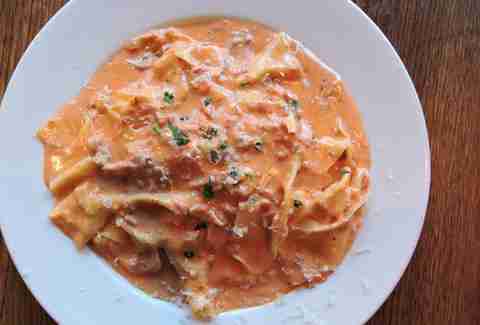 There’s a chalkboard of rotating specials and primo menu mainstays, but not many dishes can crush pasta cravings like Pitti’s pappardelle. Delicate freshly made strands swimming in tomato cream sauce flecked with smoked bacon and a generous shaving of parmigiano reggiano will leave you feeling full and in amore. 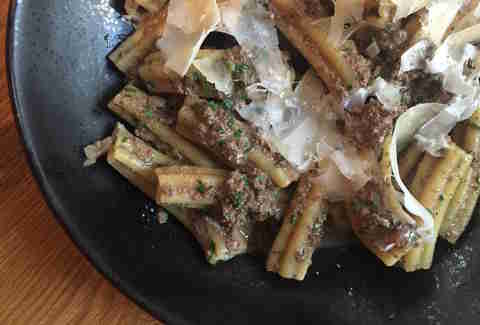 The menu at Andrew Carmellini's popular East Village outpost is practically all pasta (because what else matters, really), including spaghetti with clams and rigatoni carbonara. Chef-partner Sal Lamboglia deals with rarer noodle shapes (see the paccheri or the lumache) but it’s the simple execution and balanced flavors in this linguine dish -- thinly sliced garlic cooked with hot oil and parsley, and golden breadcrumbs on top -- that really stuns. Stephen Starr and chef Justin Smillie's Park Avenue hotspot focuses on Cali-inspired cuisine with Italian influences, with a menu that runs the gamut of the cuisine’s best hits, from pizzas to seafood to hearty meat plates. Even with such a varied line-up, Upland consistently wows with nearly every plate -- but the Estrella still stands out. Meaning star, it’s essentially a big ol’ bowl of comfort in the form of long, star-shaped tubes tossed with savory ground chicken livers, sherry, rosemary, and sage. No doubt a shining star on the menu. Tra Di Noi is newer to the Arthur Ave scene than beloved red sauce mainstays Mario and Dominick’s, but that doesn't mean it's inexperienced. It's got all the makings of a classic Italian-American joint, from the red table cloths, to the friendly staff, to the perfect lasagna bolognese. In fact, the lasagna is so impressive, we named it one of 50 iconic NYC foods to eat before you die. A sizable portion of tender noodles is topped with a generous amount of cheese and coated in a bath of hearty meat sauce -- it sounds simple, but it's pure magic, simply for the fact that it manages to be filling without being unbearably rich. NYC’s uni craze doesn’t seem to slowing down anytime soon. If you like sea urchin’s nutty, slightly sweet, and slightly salty flavor, then All'onda’s uni-laden bucatini is a must-try. Chef Chris Jaeckle coats freshly-made pasta with a savory sauce (house-smoked Maine uni, dashi-parmesan stock, garlic, and cream, brightened with white wine and lemon), then whisks in even more uni. On top: panko crumbs sautéed in Calabrian chili oil for texture and heat. The latest outpost in David Chang’s ever-growing Momofuku empire, Nishi approaches Italian cuisine through Asian cooking styles and ingredients. 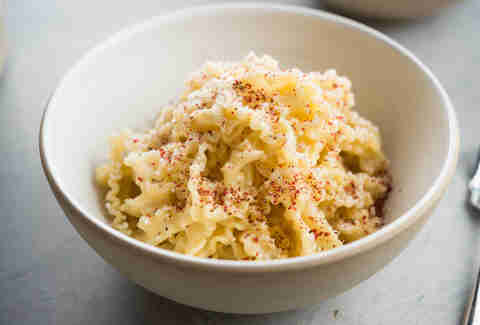 This much-hyped riff on the Roman classic cacio e pepe swaps typically used pecorino romano cheese for fermented chickpea paste -- resulting in a creamy, umami coating that works remarkably well with chef Josh Pinsky’s homemade bucatini. After a three-year hiatus, chef Missy Robbins is back in the kitchen at her highly anticipated new Williamsburg restaurant. Lilia’s menu of soulful fare focuses on simple preparations and Italian traditions, with highlights including wood-fired seafood and handcrafted pasta -- like this bowl of beautifully al dente ruffled noodles with creamy parmigiano and ground pink peppercorns. Without any other dressings, it’s a wonderfully simplistic dish, which is all the more reason why it’s so easy to fall for. It’s the type of pasta that you’d hope to make yourself, but could never quite execute -- maybe it’s the housemade noodles, maybe it’s the perfect touch of cheese and pepper -- either way, we missed you, Missy. 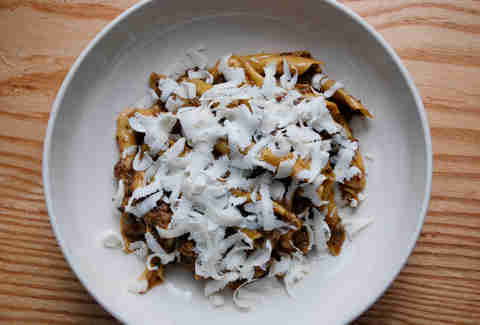 This bi-level stunner in the West Village always delivers with excellent modern Italian eats, like crispy sweetbreads with apples and pancetta, and pastas that wow across the board, but no dish impresses like the legendary garganelli: tender tubes anchoring an earthy ragu made from slow-cooked mushrooms (just as hearty as a meat bolognese) accented with zingy black pepper and shavings of salty ricotta salada. Danny Meyer and chef Nick Anderer’s rustic Roman trattoria brilliantly executes soulful central-Italian cuisine, with an all-Italian wine list to match. Here, the house pasta is downright transcendent: a bed of thick hand-torn ribbons nestled in buttery sauce with shredded roast suckling pig and peppery, citrus-brightened arugula. Malfatti means “badly made,” but the only bad thing about this dish is when there’s none left. Michael White’s seafood-centric destination off Central Park aims to impress with elegant interiors and high-end Italian ingredients, but it’s the housemade pastas that really draw attention. 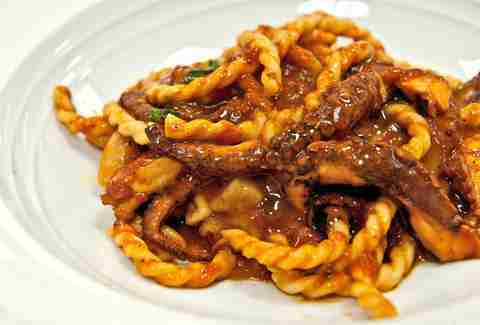 This famed fusilli is an homage to surf-n-turf: short hand-shaped ribbons interlaced in a vibrant sauce made with sweet baby octopus (braised in red wine, San Marzano tomatoes, and fresh herbs) and buttery Pat LaFrieda bone marrow. A sprinkling of seasoned breadcrumbs lends a crunchy textural contrast. At this classic Arthur Ave red sauce joint, you're expected to come in knowing what you want to order. If not, the waiter will recite the menu to you, but you'll never actually see a paper copy (and prices will come with the check). Absolutely everything about it screams family-style, from the communal seating to the insanely huge portions. Dominick's is known to have some of the Bronx's best pizza (get the gourmet slices, like the shrimp scampi), but it's the pasta, namely the Linguine alla Gianni (an enormous pile of al dente strands topped with just the right amount of chopped shrimp and clams), that really shines. Expect to take home leftovers. Some classics shouldn’t be messed with, as proven by Scarpetta’s straightforward spaghetti -- a simple swirl of al dente housemade strands coated in fresh tomato sauce with a sprinkle of basil -- which might be the least complicated dish on the menu at this perpetually hip eight-year-old restaurant, but it’s the one that keeps people coming back again and again. It’s all in the control of these simple ingredients -- the sauce is creamy, but not overly so, and the basil has a noticeable flavor, without overpowering the dish. Yes, you could make it at home, but it’ll never be anywhere as good as this. At this almost intimidatingly elegant spot (note the black, red, and gold decor and a candle-lit marble staircase in the center of the room) from team Batali-Bastianich and chef Mark Ladner, all pastas are made in-house. 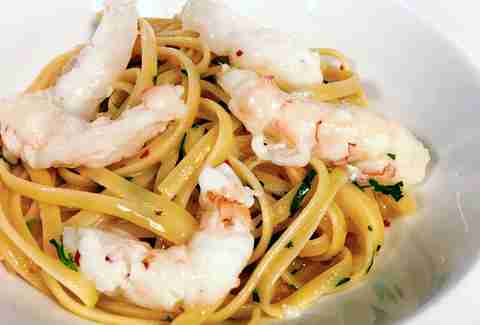 But an exception was made for this linguine, which hails from specialty importer Marcelli Formaggi. The dish, which traditionally involves shrimp, white wine, some lemon, garlic, and red pepper flakes, is taken to the next level here with poached langoustines, garlic, lemon, and pepperoncino-infused oil, culminating in a much more complex taste. Gluten-free? No sweat! 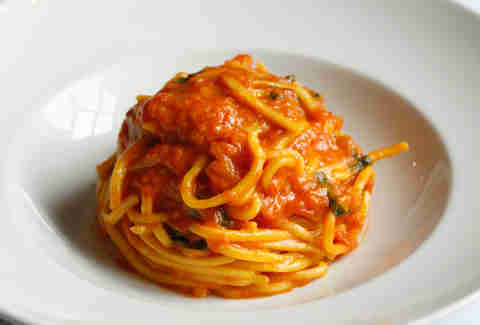 Del Posto now offers GF versions of every pasta on the menu. Since 2004, this quintessential neighborhood restaurant in Carroll Gardens has been serving classic housemade pastas like gnocchi and ravioli, but it’s the instant-classic cavatelli that stands out -- perfectly al dente noodles peppered with fat rounds of spicy sausage (from Bleecker Street’s famed Italian specialty store, Faicco's) and simmered in an aromatic browned butter sauce. You can also get it at the West Village outpost. Meaning “the white sheep” in Italian, La Pecora Bianca comes from a highly impressive team -- Claudette’s Mark Barak and executive chef Simone Bonelli (who was the sous-chef at under Massimo Bottura at Osteria Francescana in Modena when it was named the second best restaurant in the world). Bonelli’s menu features a number of housemade pastas, but the standout is the gramigna: hollow curls made with Einkorn wheat tossed with housemade pork sausage crumbles, garlic, chili flakes, broccolini, and parmesan. Manetta's is about as charming as it gets, from its humble interiors to its housemade pasta dishes that taste straight out of your mom's kitchen. As the area around it rapidly changes, this underrated family-run joint sticks proudly to its old-school roots -- it's that neighborhood spot you can count on for an always-comforting pasta dish, like trenette ai quattro formaggi or spaghetti alla carbonara. It's the former that should really get you here, though -- homemade spaghetti coated in a blend of fontina, Gorgonzola, fresh mozzarella, and Parmigiano. It's ridiculously rich, so it's by no means an everyday meal, but on cold, rainy days, or when you're just not feeling particularly hot, it's a true savior -- as comforting as being in your childhood home. 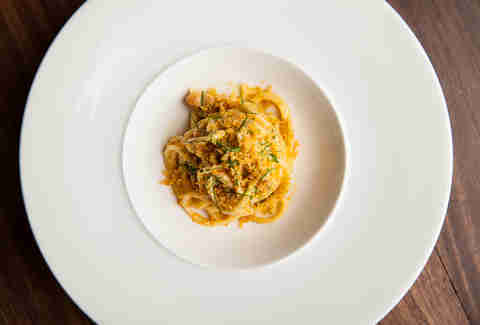 Mario Batali’s flagship restaurant -- a charming former carriage house in the West Village -- does high-end Italian fare right by taking classic dishes and elevating them with the simplest, yet most refined touch (see linguine with clams and hot chiles or black spaghetti with fennel, jalapeños, and bottarga). 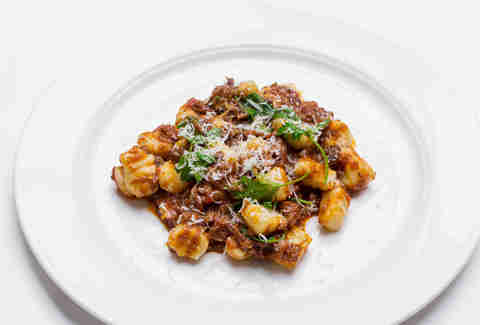 It’s still one of the hardest reservations to score in town, but this pasta alone is worth the hassle and hype: pillowy made-in-house potato gnocchi cuddling shreds of oxtail that’s been braised until falling-apart tender in a robust red wine and tomato-based ragu. Mic drop. 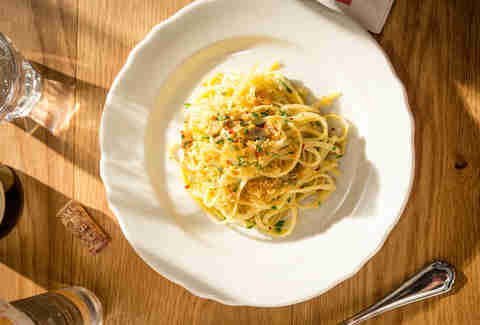 Since opening in late 2014, this popular NoHo eatery has been turning out impressive Italian-Mediterranean fare, including a number of pizzas (like one with hot peppers and one with sopressata and Calabrian chiles) and several housemade pastas, from classics like cacio e pepe to an elevated spaghetti alla chitarra with lobster. 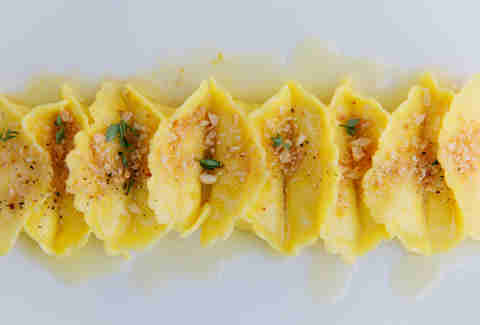 But it's Chef Hillary Sterling’s delicate borsa pasta (“little purse” in Italian) that’s the true star. The purses are gently stuffed with sheep’s milk ricotta and dressed in a delightful lemon-butter sauce with chopped hazelnuts. There’s eight to a plate, and these babies go down easy. A family owned and operated ristorante tucked behind an unassuming storefront in LIC (seriously, you can barely make out the sign), Manducati’s sticks to old-school Italian classics. And does them well. When you want a traditional stick-to-your-ribs, sauce-dripping-down-your-chin bowl of macaroni, the fettuccine -- handmade ribbons mounted with a generous heap of veal-beef bolognese in tangy marinara sauce -- gets the job done every time. Megan Murphy (aka “This Girl Can Eat”) is a contributing writer at Thrillist whose ideal “last meal” scenario absolutely involves pasta -- and her mom’s meatballs. Follow along on her culinary adventures on her website, Twitter, and Instagram.